For the third instalment of my summery meatball challenge, I decided it was time to go Spanish. Turning to Claudia Roden’s The Food of Spain and Rick Stein’s Spain I found exactly what I was looking for. A combination of rich and light food, this meal was satisfyingly Spanish. 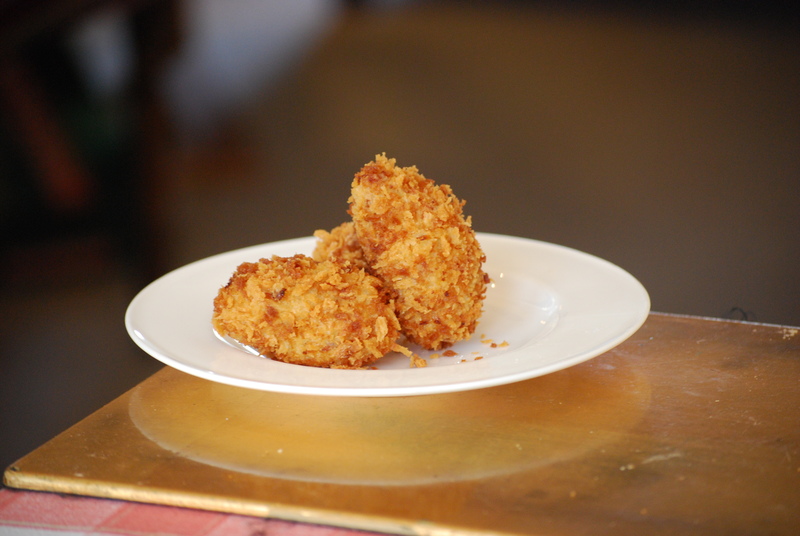 The starter, Stein’s chicken croquettes (recipe here) were a little fiddly but worth the effort. Having a deep fat frier definitely helps. I improvised with some old parma ham as it needed using up. Despite being deep fried, these were light, tasty and surprisingly fun to make. Roden’s meatballs in almond sauce (recipe here) were utterly divine – soft, saffrony and moreish. Probably the best dish of all three menus. The sauce is thickened by using a picada of fried bread, almonds and garlic. I served them with my “Maria” potatoes, named after a family friend who used to make them for me when I was younger. The potatoes need to be diced very small and fried in plenty of olive oil until they begin to clump together and get slightly brown. The recipe for the ice cream comes from Rick Stein, and I have to admit I found it a bit too sweet. It was light and refreshing nonetheless, and the fragrant orange blossom water was perfect in it. It was pretty simple to make, too. I went a bit too freestyle on the biscuits, and didn’t bother with a recipe, which is why they turned out so odd-looking. They were nice though, as I added lots of chopped dates, cardamom, mixed spice and orange zest to the mixture. Tags: almond, biscuits, chicken croquettes, claudia roden, ice cream, meatballs, orange blossom, potatoes, rick stein, saffron, serrano, spain, spanish. Bookmark the permalink. I just found your blog, and have enjoyed the posts I have read, and I would like your opinion.